Journal of Nanjing Agricultural University, 2019, 42(2): 191-200. 张红生, 程金平, 王健康, 等. 水稻种子活力相关基因鉴定及分子调控机制[J]. 南京农业大学学报, 2019, 42(2): 191-200. 通信作者：张红生, 教授, 博导, 从事水稻抗逆遗传育种与种业科学研究, E-mail:hszhang@njau.edu.cn. Abstract: Rice is the most important food crop in China. Rice seed vigor is a complex quantitative trait controlled by multiple genes and it is of great significance to improve rice seed vigor for high yield, quality and efficiency of production under direct seedling rice. This paper reviewed the main research advances including evaluation index, gene identification and cloning, molecular regulation mechanism relate to rice seed vigor in recent years. Based on the molecular markers and map-based cloning, genome-wide association study(GWAS), high throughput sequencing, and omics techonology, more than twenty-three key genes related to seed vigor have been cloned, including transcription factor genes, metabolism-related genes of plant hormone ABA and GA. Through the balance of ABA and GA metabolism, it regulates maturing of embryos, seed dormancy and germination, seedling growth. It will be very helpful to improve genetics of rice seed vigor by molecular design breeding technology in the future. EMB与MAT分别是指种子胚胎形成与成熟过程; DE与PD分别指干燥脱水与休眠后期种子成熟过程; AR、Check与Ready分别指无休眠具有活力的种子、种子快速吸水后转折点及其萌发准备阶段; AS、SD与RC分别指非生物逆境胁迫、二次休眠与破休眠种子恢复过程; ABA与GA分别为脱落酸与赤霉素。 A.The simplified model of seed development, dormancy, germination and seedling stages; B.The transcription and translation of mRNA and protein during seed development and germination; C.The effect of abiotic stresses on seed vigor in fields, such as drought, low temperature, salt and light. 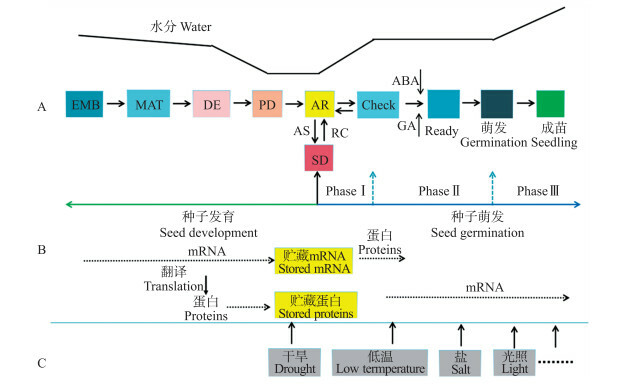 EMB:Embryogenesis; MAT:Maturation; DE:Desiccation; PD:Primary dormancy; AR:("after ripened" seeds) non￣dormant seeds; Check: Control checkpoint involving ABA and a possible reinduction of the maturation program; Ready:Final step before radicle emergence; AS:Abiotic stress; SD:Secondary dormancy; RC:Recover conditions; ABA:Abscisic acid; GA:Gibberellins. 图 2 已经克隆的水稻种子活力关键基因 Fig. 2 The cloned genes related to seed-vigor in rice 黑色字体代表图位克隆技术克隆的基因, 包括OsGA 20ox2、OsVP1、qLTG3-1 、OsGA 20ox1、OsPLS1 、qSD 7-1/qPC7、GD1 、Sdr4 ; 红色字体代表电子克隆技术克隆的基因, 包括OsHSP18.2 、OsPYL/RCAR3 、ARAG1、OsPIP1; 1 、OsPIMT2 、OsPYL/RCAR5 、OsPP 2C51、OsPYL/RCAR9 、OsLOL1、OsPIMT1、OsSCP46 、OsFbx352 ; 蓝色字体代表基于GWAS和组学技术克隆的基因, 包括OsSAP16 、OsCDP3.1 、OsIMPS1; 黄色条框代表染色体上的丝粒。 The black genes were cloned by map-based, including OsGA 20ox2, OsVP1, qLTG3-1 , OsGA 20ox1 , OsPLS1 , qSD 7-1/qPC7 , GD1 , Sdr4 ; Red genes cloned based on in silica, including OsHSP18.2 , OsPYL/RCAR3 , ARAG1 , OsPIP1;1 , OsPIMT2 , OsPYL/RCAR5 , OsPP 2C51, OsPYL/RCAR>9 , OsLOL1 , OsPIMT1 , OsSCP46 , OsFbx352 ; Blue genes cloned based on GWAS or genomics ways, including OsSAP16 , OsCDP3.1  and OsIMPS1 . Yellow boxes represent centromeres on the chromosome. 图 3 脱落酸(ABA)和赤霉素(GA)调控水稻种子活力的分子机制 Fig. 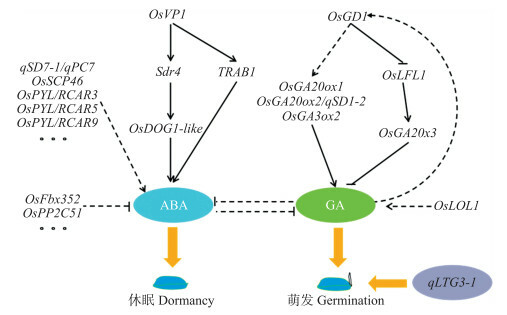 3 The molecular mechanism of rice seed-vigor regulation with ABA and GA OsVP1正调控Sdr4、OsGOG1-like和TRAB1基因的表达, 促进ABA积累, 引起种子休眠[40-41]; qSD7-1/qPC7、OsSCP46、OsPYL/RCAR3、OsPYL/RCAR5和OsPYL/RCAR9基因正调控ABA, 促进ABA合成, 诱导休眠; OsFbx352和OsPP2C51负调控ABA的合成, 间接促进萌发。OsGD1通过促进OsGA20ox1、OsGA20ox2(与qSD1-2为同一基因)和OsGA3ox2合成, 或抑制OsLFL1表达, 抑制GA分解基因OsGA20x3表达, 促进GA合成, 诱导种子萌发; GA也可以通过反馈调节影响OsGD1的表达; 同时, OsLOL1可正调控GA合成。qLTG3-1通过调节组织的细胞液泡化, 引起细胞组织的松弛, 促进种子萌发。 The gene OsVP1 positively regulated expression of Sdr 4, OsGOG1-likeand TRAB1, and further increased accumulation of ABA to induce dormancy of rice seeds[40-41]; The genes qSD 7-1/qPC7 , OsSCP46 , OsPYL/RCAR3 , OsPYL/RCAR5 and OsPYL/RCAR9  positively regulated syntheses of ABA to induce seed dormancy; The genes OsFbx352 and OsPP 2C51 negatively regulated synthesis of ABA indirectly promoting germination of seeds。The genes OsGD1  might up-regulate the expression of OsGA 20ox1 , OsGA 20ox2 (same as qSD1-2)and OsGA 3ox2, or down-regulate expression of OsLFL1 to inhibite expression of OsGA 20x3, a gene for GA degrading, and increase synthesis of GA to induce germination of rice seeds; The GA might also feedback the expression of OsGD1  and the OsLOL1  up-regulate synthesis of GA to affect the seed germination。The gene qLTG3-1  might regulate vacuolation of tissues covering the embyo and cause tissue weakening to induce seed germination. 孙群, 王建华, 孙宝启. 种子活力的生理和遗传机理研究进展[J]. 中国农业科学, 2007, 40(1): 48-53. 张红生, 胡晋. 种子学[M]. 2版.北京: 科学出版社, 2015. Zhang H S, Hu J. Seed Science[M]. 2nd ed. Beijing: Science Press, 2015 (in Chinese). 张安鹏, 钱前, 高振宇. 水稻种子活力的研究进展[J]. 中国水稻科学, 2018, 32(3): 296-303. Zhang A P, Qian Q, Gao Z Y. Research advances on rice seed vigor[J]. Chinese Journal of Rice Science, 2018, 32(3): 296-303 (in Chinese with English abstract). Bewley J, Bradford K, Hilhorst H, et al. Seeds:Physiology of Development, Germination and Dormancy[M]. New York: Springer, 2013. 李振华, 王建华. 种子活力与萌发的生理与分子机制研究进展[J]. 中国农业科学, 2015, 48(4): 646-660. Li Z H, Wang J H. Advances in research of physiological and molecular mechanism in seed vigor and germination[J]. Scientia Agricultura Sinica, 2015, 48(4): 646-660 (in Chinese with English abstract). Gu X Y, Liu T L, Feng J H, et al. The qSD12 underlying gene promotes abscisic acid accumulation in early developing seeds to induce primary dormancy in rice[J]. Plant Molecular Biology, 2010, 73(1/2): 97-104. Ye H, Feng J H, Zhang L H, et al. 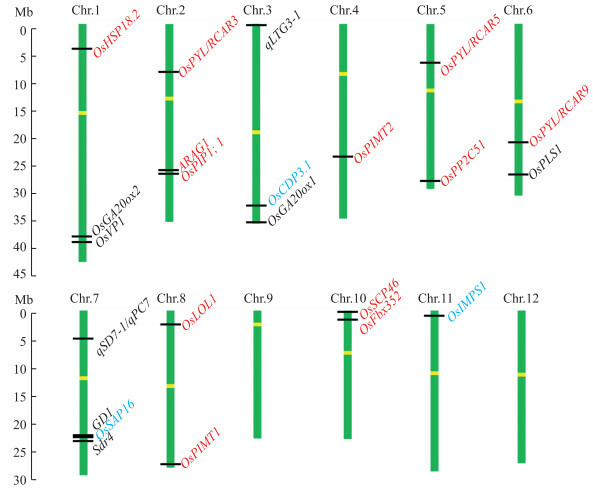 Map-based cloning of seed dormancy1-2 identified a gibberellin synthesis gene regulating the development of endosperm-imposed dormancy in rice[J]. Plant Physiology, 2015, 169: 2152-2165. Bhatnagar N, Min M K, Choi E H, et al. The protein phosphatase 2C clade A protein OsPP2C51 positively regulates seed germination by directly inactivating OsbZIP10[J]. Plant Molecular Biology, 2017, 93(4/5): 389-401. Kaur H, Petla B P, Kamble N U, et al. Differentially expressed seed aging responsive heat shock protein OsHSP18.2 implicates in seed vigor, longevity and improves germination and seedling establishment under abiotic stress[J]. Frontiers in Plant Science, 2015, 6: e00713. Wei Y D, Xu H B, Diao L R, et al. Protein repair l-isoaspartyl methyltransferase 1(PIMT1) in rice improves seed longevity by preserving embryo vigor and viability[J]. Plant Molecular Biology, 2015, 89(4/5): 475-492. Xu E S, Chen M M, He H, et al. Proteomic analysis reveals proteins involved in seed imbibition under salt stress in rice[J]. Frontiers in Plant Science, 2017, 7. Lu Q, Niu X J, Zhang M C, et al. Genome-wide association study of seed dormancy and the genomic consequences of improvement footprints in rice(Oryza sativa L.)[J]. Frontiers in Plant Science, 2018, 8: e02213. Howell K A, Narsai R, Carroll A, et al. Mapping metabolic and transcript temporal switches during germination in rice highlights specific transcription factors and the role of RNA instability in the germination process[J]. Plant Physiology, 2009, 149(2): 961-980.